Summer rolls made with a filling of Napa cabbage, cellophane noodles, cooked ground turkey, mint, and cilantro, rolled in rice paper and served with a dipping sauce. Make dipping sauce by combining soy sauce, rice vinegar, sugar and chili paste in a small pan and mix well. Boil for one minute. Add green onions and peanuts. Cool. Peel and grate fresh ginger root. Sauté garlic, ginger and ground turkey, cooking for 3 minutes. Stir and break up big pieces. Remove from pan. Cover cellophane noodles in hot water and soak for 5 minutes. Drain, dry and cut into 2-inch lengths. Set aside. Thinly slice napa cabbage, cilantro and mint. Soak rice paper in a shallow baking pan with hot (nearly boiling) water until pliable, from 1/2 to 1 minute (Be careful not to leave the rice paper in the hot water for long or they become too soft and difficult to handle.) Lay soaked rice paper on paper towels to dry off excess water. Place a layer of napa cabbage, mint and cilantro, cellophane noodles and turkey in the middle of the rice paper. (Do not extend the fillings to the outer edges because you will need to fold the edges in when rolling up.) 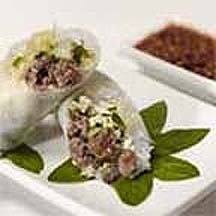 Roll up rice paper tightly around filling and after rolling halfway, fold in ends. Continue rolling. Cover rolls with a damp towel to keep them from drying out before you serve them. To serve, slice in half and serve with the dipping sauce. Recipe and photograph provided courtesy of Honeysuckle White, a division of Cargill, Incorporated. Used with permission.